31 anglers fished the Specimen Lake on the open with wind lashing from left to right. Conditions made presentation very difficult so method and bomb & pellet accounted for most of the carp and bream. 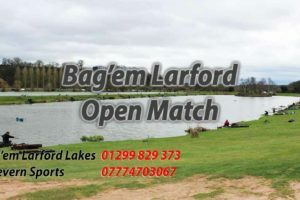 2nd on the day was Phil Bishop (Larford) who drew peg 48 and fished method and later down his edge to weigh 117-11-00. 4th on the day was Stu Almond (St Anthony’s ) who caught on method & bomb weighing 110-06-00 from peg 67. 5th overall was Phil Briscoe (Larford) who drew peg 72 catching early on method & bomb and later on paste. 6th on the day was Richie Aherne (Frenzee) who drew peg 50 weighing 80-08-00 to method feeder & paste.